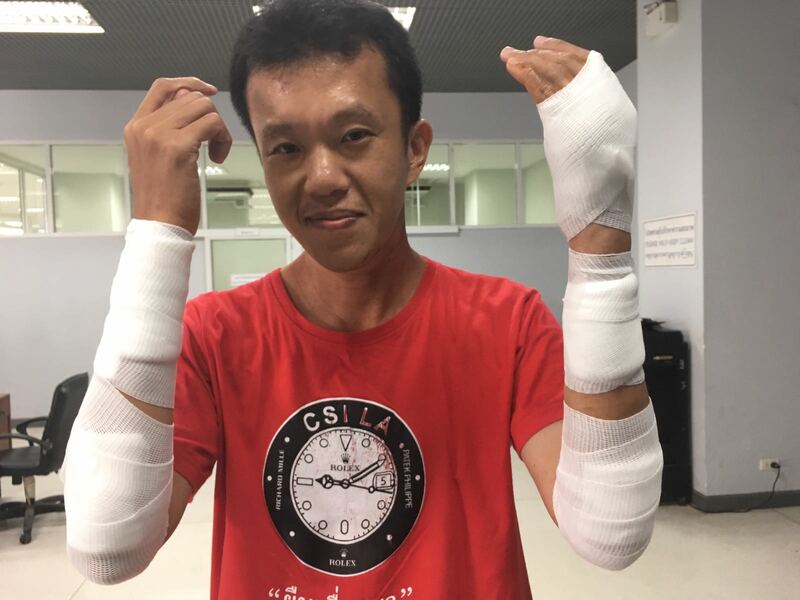 A well-known political activist, Ekachai Hongkangwan, was injured in the latest attack as a result of his attempt to incessantly hold the government accountable for corruption. This time, he was struck on his arms with a large wooden stick. (Update: 15.30) Ekachai revealed that after getting off the bus he took from the Government House, he saw two men pulling their motorbike over in front of a bike repair shop at the mouth of his alley. Ekachai could notice that both of them stared at him. Though he had a hunch it was not unusual, he continued walking to his house in the next alley. Ekachai kept walking into the alley running into a junction closer to his home. Suddenly, someone called out his name, when he turned back to see, he saw the two men on motorcycle driving behind him and then stopping. One of them tried to hit him with his helmet. During the initial attack, a third man appeared out of nowhere. He walked toward him and hit him with a wooden stick 4-5 times. Ekachai lifted his arms in his defense. While the third man hit him, the other two men were standing by. Ekachai further recalled that after hitting him so strongly and losing his grip of the wooden stick, the third man turned around looking for another wooden stick to hit him even more. So he started to run home and that man did not pursue him. According to Ekachai, he was not familiar with the three men and thought they were in their 20’s. They spoke nothing while taking the action against Ekachai. After the incidence, he reported the case to the Lat Prao Police Station. He was then transferred to the hospital for medical treatment and examination as part of the legal proceeding. From the examination, he suffers two fractured bones on left hands and had to wear a splint, probably for around one month. Such attack against him was not the first of its kind. He has been targeted for some time, and this was probably the fifth attempt to physically abuse him. Prior to this, Ekachai was subject to physical abuse on 14 Aug 18 at 9.30 at a bus stop close to Mission Hospital on Sawankhaloke road. Two unknown men on a motorbike without license plate threw fermented fish on him. Both were wearing helmets. He was waiting for a bus to get to the Government House to offer a birthday present to the Deputy Prime Minister, Minister of Defence, and a member of the National Council for Peace and Order (NCPO). Still, he managed to travel to the Government House to offer the present to the General as wished. He wanted to enter through Gate 4, but it was locked down so he could not get to meet the Deputy Prime Minister. He decided to report the case to the police officials at the Nang Lerng Police Station bringing with him a green bucket left over by the perpetrator after throwing fermented fish on him. He left the bucket with the police for further investigation. The police officials came to inspect the crime scene and wrote a report about the incidence. He was told it would have taken one month to examine the fingerprints left on the bucket. Ekachai has been involved with several political actions starting from lighting incense sticks to dispel evil spirit of the government in front of the Army Headquarters. It has resulted in him being subject to a series of harassment. Once a person with opposite political view, Mr. Ritthikrai Chaiwannasat, waited to punch him at a bus stop at the mouth of his alley. It has stemmed from his attempt to hand deliver General Prawit Wongsuwan a clock amidst outcries about his possession of luxurious wristwatches. 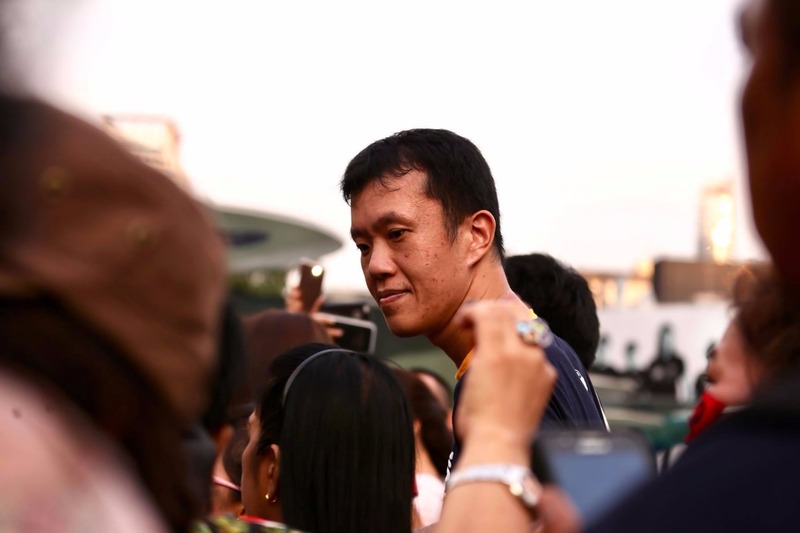 He was once arbitrarily apprehended in front of his house by police officials and was taken away for detention after an arrest warrant had been issued for him for organizing a public assembly on the Pathumwan Sky Walk. During 24-28 October 2017, Ekachai was taken by the police from his home to a resort in Kanchanaburi, after he had posted in his facebook declaring that he was to wear a red shirt on 26 Oct 17. On 6 July 18 around 11:40, inside Lat Prao 109 where his house is situated, a group of students in the name of “Socially Concerned Young People”, about 18 of them, came to his house armed with banners and reading a statement to protest against him and condemn him for his acts. The protesters claimed his opinion about the Navy SEAL and military officers who were engaged in an operation to rescue 13 persons trapped in a cave was condemnable as he was politicizing the issue and attempting to demoralize the officers. The incidence was observed by some officers. He revealed to the Thai Lawyers for Human Rights (TLHR) that he was told that the officers had fined the protesters after the assembly. There was no progress afterward. On 16 April 18, plainclothes police and military officials have apprehended him in front of his house. According to Ekachai, it was a combined force of police from three police stations including Lat Prao Police Station, Choke Chai Police Station and Hua Mark Police Station (all of which were under jurisdiction of Metropolitan Police Division 4. On that day, another political activist, Mr. Chokchai Paiboonratchata, was also held in custody, probably as a result of his facebook post on 15 April declaring that on 16 April at 7.30, he and Ekachai are going to participate in a blessing ceremony on the Thai traditional New Year Day at the residence in Lat Prao 71 of the Deputy Prime Minister (National Security), General Prawit Wongsuwan. The ceremony was supposed to be attended by only military officials. Around 17.45, plainclothes police officials have gone to the house of Ekachai. While waiting at a bus stop, he was nabbed by police officials and taken to the Metropolitan Police Division 4. He was not informed as to which power was invoked to have him taken into custody. During the arrest, the police officials even applied force on Ekachai by pinning him on a footpath and then took him to the Choke Chai Police Station and then to the Metropolitan Police Division 4. During the travel, the police officials covered his head with a plastic bag and pinned him to the seat in the car. They have even seized his phone. The police officials failed to inform them as to which laws they had violated. During their custody, Mr. Anon Nampha, an attorney, has asked for a meeting with them at the Metropolitan Police Division 4. The official has made an arrest memo, but Ekachai refused to sign his name on the memo. Around 11.00, both were released from the Metropolitan Police Division 4 and were given back their phones. But the photos when the incidence took place and were taken by Ekachai have been deleted. Ekachai Hongkangwan taken by police officials for physical examination and medical treatment at the hospital. It does not matter as to the motive behind the latest bodily harm inflicted on Ekachai Hongkangwan. Undeniably, it could have stemmed from his active role and his exercise of the right to freedom of expression in order to investigate corruption. In order to prevent the escalation of violence as a result of the physical abuse against Ekachai, it is essential to call for political tolerance in Thailand. Harassment against Targets’ Family and Relatives: NCPO’s Practice Amounts to Human Rights Violations.